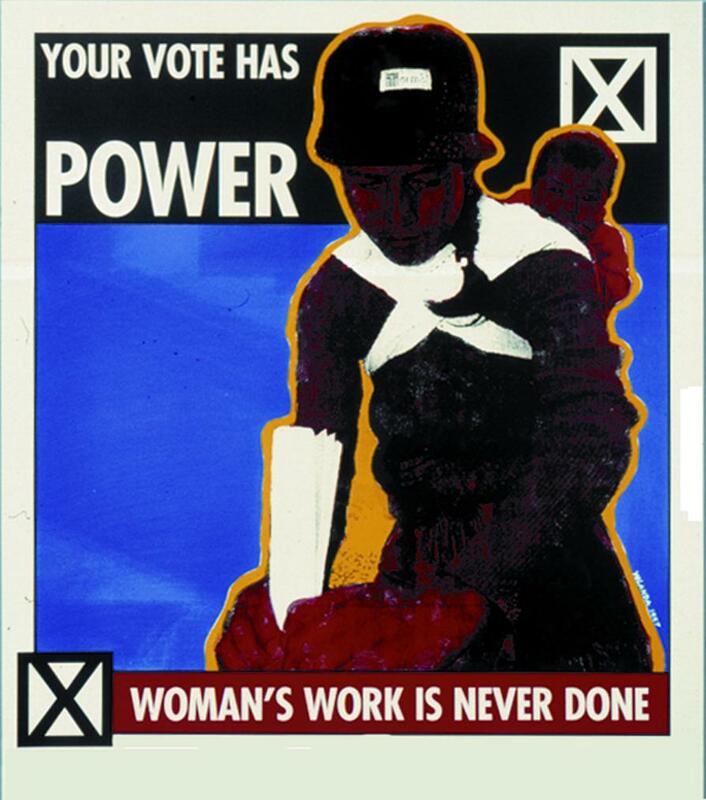 Yolanda M. López, Your Vote Has Power (2007). Lithograph, 24 x 32 inches. Yolanda M. López’s York Vote Has Power was featured on the Autumn 2008 issue of Signs (volume 34, number 1), which featured a comparative perspectives symposium on challenges to women’s leadership. This work was printed by the Brodsky Center for Innovative Print and Paper at Rutgers University during the artist’s residency there. The title is taken from a political rallying cry used in South Africa during the first time all citizens could vote, black and white. Coming out of the civil rights movement, the feminist movement, and the Chicano/Chicana movement together, it became clear to me that as an artist I was interested in how images function and how they affect us. The content and context of images shape who we feel we are, how other people see us, and the consensus we have as American people. My work is about the imaging of women; it is about how we as Chicano/Chicanas see ourselves. The images should reflect who we are and what we want to be. As an artist I just feel it’s one way I can contribute to our freedom and equality. It’s part of self-determination. And it is political. Yolanda M. López is a San Francisco–based conceptual artist, educator, and scholar. In 1968 she participated in the San Francisco State University Third World Strike. Since that point she has viewed her work as an artist as a tool for political and social change and sees herself as an artistic provocateur. She is best known for her groundbreaking Virgin of Guadalupe series, an investigation of the Virgin of Guadalupe as an influential female icon. Classically trained as a painter, her work has expanded into installation, video, and slide presentations. López has taught studio classes and has lectured on Chicano art at the University of California at Berkeley, Stanford University, Mills College, the University of California at San Diego, and the California College of Art.